Srinagar, Apr 15: Civilian traffic was resumed on Monday after remaining suspended for one day to allow free and safe movement of security force convoy on Srinagar-Jammu national highway, the only road linking the Kashmir valley with the rest of the country. The authorities have banned civilian traffic twice in a week on Sunday and Wednesday to allow free and safe movement of security force convoy on the highway following, February 14, Jaish-e-Mohammad (JeM) fidayeen attack at Awantipora in Pulwama which claimed the lives of 44 CRPF personnel and similar unsuccessful attempt took place in Jawahar tunnel area. However, the ban evoked sharp reaction from mainstream and separatists political leaders and was challenged in the High Court. Interestingly security force convoy are also plying on other days on the highway along with civilian traffic. "We allowed only one-way civilian traffic on the Srinagar-Jammu on Monday", a traffic police official told TNN, adding that no vehicle was allowed on the highway on Sunday.Today vehicles will ply from Jammu to Srinagar, he said, adding majority of the Heavy Motor Vehicles (HMVs), including those carrying essentials, petrol, diesel tankers and LPG were allowed to move. The HMVs were allowed to move towards Kashmir last evening, till 0100 hrs, he said. Official said that the Light Motor Vehicles (LMVs) were allowed to move towards Kashmir from different parts of the Jammu now. However, the LMVs have to cross Jakhen, Udhampur between 0500 hrs to 0900 hrs. No vehicle will be allowed after the deadline. Meanwhile, truckers alleged that due to ban on the highway, twice in a week, it took them around ten days to complete a single trip to Kashmir, which has badly affected their earning. Only one-way traffic is allowed on the highway for the past two years due to road widening, frequent landslides and shooting stones, particularly between Ramban and Ramsu. During this winter, Kashmir valley faced acute shortage of essentials, particularly vegetables, meat, chicken due to frequent closure of highway due to snow, landslides and shooting stones.Similarly, snow clearance operation was going on historic Mughal road which remained closed since November last year due to snow. 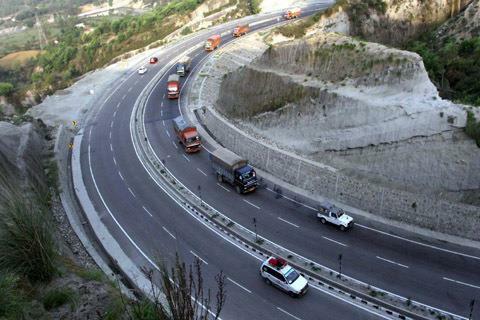 The road, seen as alternative to Srinagar-Jammu national highway, is connecting Shopian in south Kashmir with Rajouri and Poonch in Jammu region. Snow clearance operation was also going on Anantnag and Kishtwar in Jammu.